My late, Southern grandfather would be proud. Although I’ve been bewitched by Italy for some time, my people are from western North Carolina, and so I have a soft spot for fried chicken too! We purchase whole chickens from Forks Farm and then cut them up and freeze for later use. Wings are finger food and don’t really fit into the cooking we do at the restaurant, and so they often end up on our family table. More often than not, we fry them, Southern style. Because fried chicken is dear to many people, there are many recipes out there which take the subject very seriously. Unfortunately, I’ve never really found a recipe that wows me. Different writers hold up various things as essential: some say the chicken must be brined, others say it must be steeped in buttermilk, still others say the chicken must spend some time covered while it is cooking, others skip the brining and buttermilk and just toss dry chicken with flour and fry. Just like with the authors of contradictory gnocchi recipes, the authors of all of these approaches deem theirs the best, and so something funny must be going on. 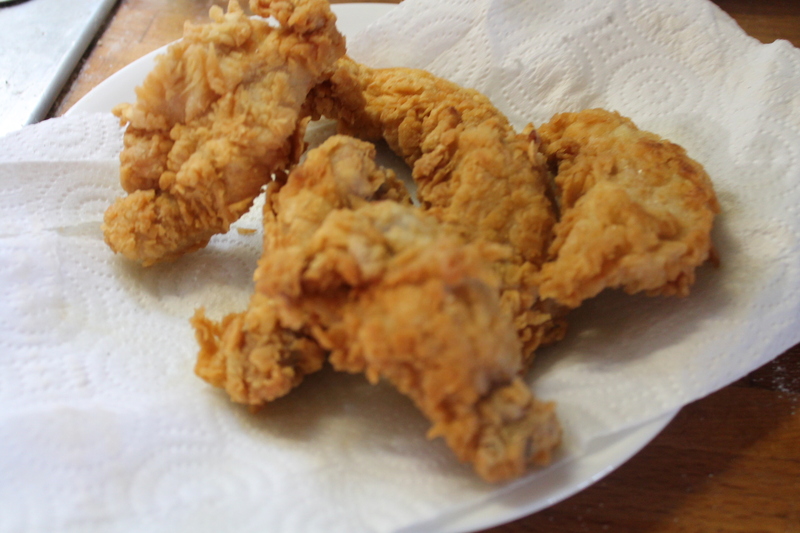 Recently I found an approach that produces fried chicken which really wows me. The funny thing is, the essential technique contradicts most classic recipes. My epiphany camewhile researching a way to fry mussels. My classic frying batter is the simple one known as “la pastella” which I learned from Marcella Hazan’s excellent cookbooks. But this time I was looking for something a little different, a little more like the extra crispy batter one can order at KFC (though I’ve sworn off fast food and haven’t eaten at KFC in 20 years). 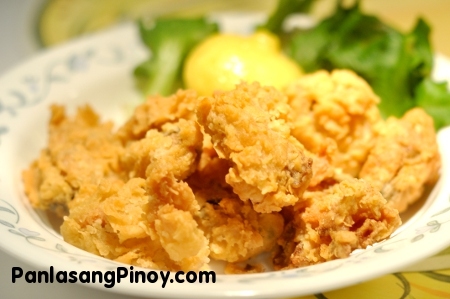 So I googled images of fried mussels and hit the jackpot, finding an image which was exactly what I was looking for, courtesy of the website http://panlasangpinoy.com. 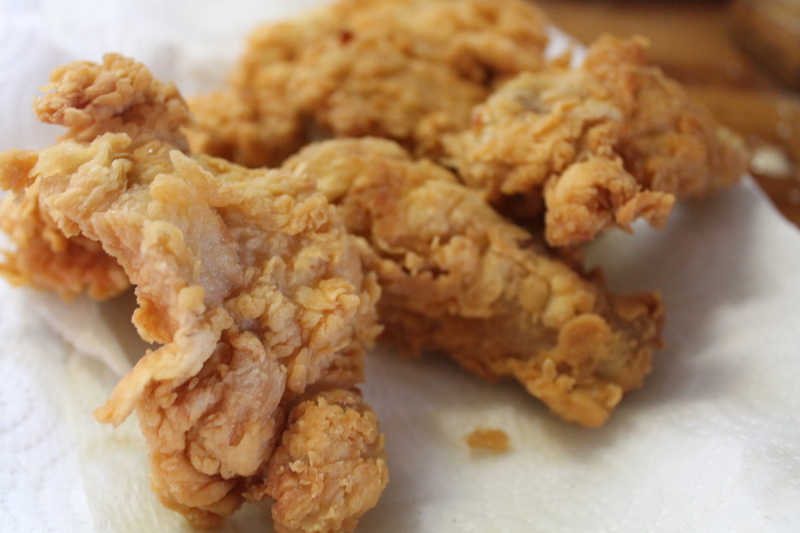 Inspiration for my fried chicken batter. This batter worked great for mussels, and it occurred to me that it was exactly what I wanted for fried chicken too. 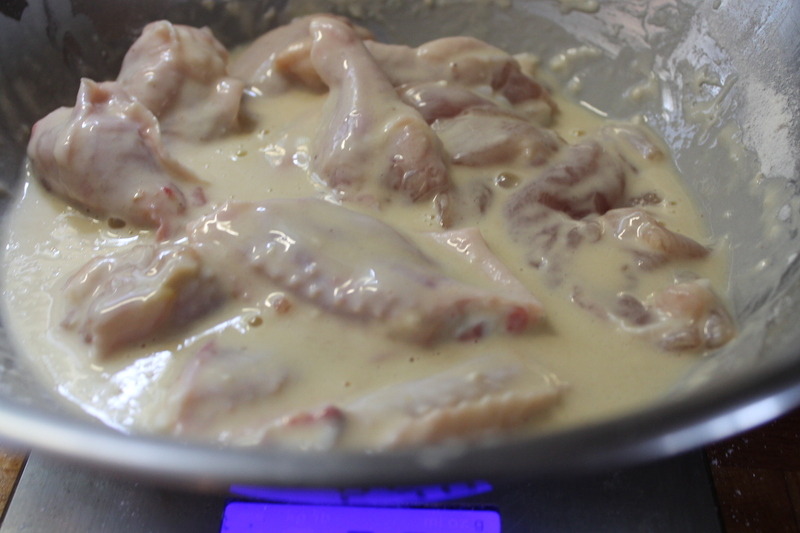 The secret is to dip the chicken in liquid (mix of flour, water, and egg) but then NOT to let the excess liquid drip back into the bowl as almost every recipe suggests. 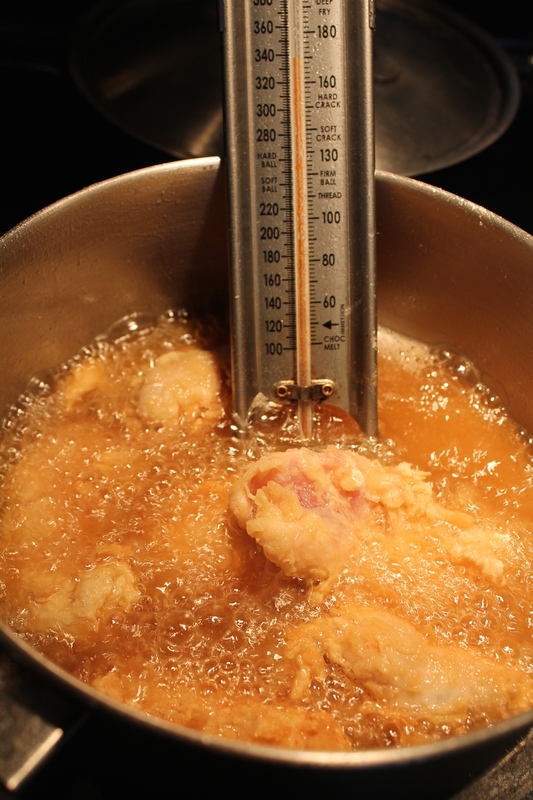 Instead, the extra liquid clinging to the chicken forms little lumps or scales with the flour, and it is these little lumps or scales which will fry up into the most succulent, crisp, and flaky batter one can make. I’ve simplified the batter a bit, and you can find the recipe below. This experience is such a great reminder of how recipes can be (and often are) simply wrong. No brine is needed, no buttermilk is needed. Just proper seasoning and the right technique with the batter. I fry wings exclusively. 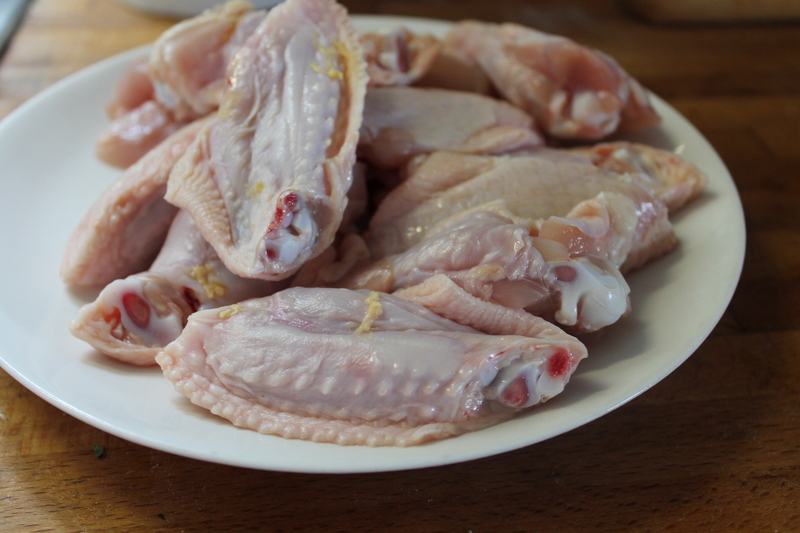 Not only do I have a lot left over from the chickens I use for the restaurant, but the wings are ideal for frying: their small size ensures quick cooking. It is possible but much harder to fry other pieces, since it is hard to get the inside cooked through without the outside burning. It can certainly be done with moderate heat, but my advice is to just fry the wings! These wings are gorgeous because they are raised locally. Look how clean and fresh they are! 1) Season the wings generously with salt (one of the most important steps, of course), and let sit for 5 or 10 minutes (or up to a few hours), while the salt is absorbed. 2) Mix 1 egg with 1/2 cup of water and 1/2 cup of flour. The batter should be like a thick heavy cream. This amount is for about 10 wings. Scale up as needed. 3) Add the wings to the batter and take one at a time and add to a bowl or bag with plenty of flour and toss thoroughly. 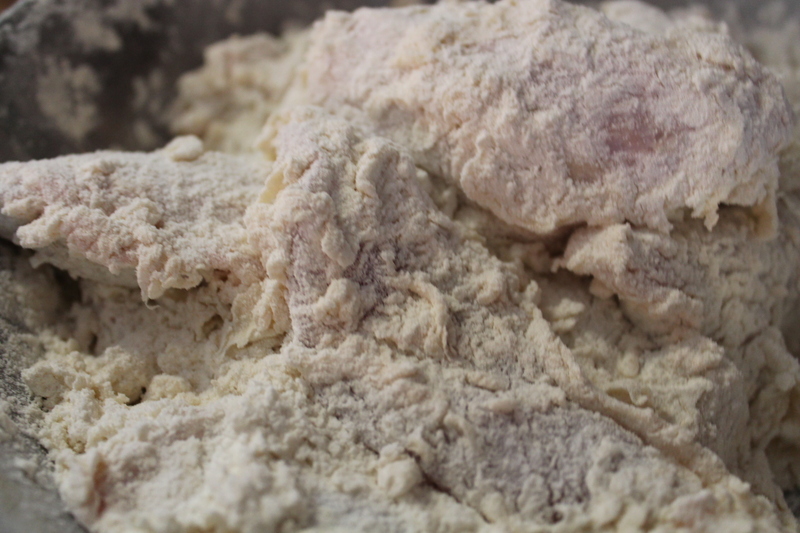 The flour should form lumps on the chicken pieces. If it doesn’t, the batter is probably too thin, and you can thicken the batter with a little more flour. Note the little lumps of flour. This is what you need. 4) Once all the chicken pieces are coated with flour, fry in a heavy pan (cast iron is ideal), in 1/2 to 1 inch of canola or other frying oil. The ideal temperature is around 325 to 350 degrees. At this temp, the chicken should fry gently without burning. At this temp, cooking for about 3 or 4 minutes per side should cook them wings through. 5) Serve at once, or slightly cooled. The wings will stay crisp for at least 10 minutes or so. Look at that texture. To me, this is what great fried chicken is all about!